Walk to Monarch Beach (Salt Creek Beach) along a secluded pathway with no traffic along the golf course until you reach the isolated Salt Creek Beach. You will feel like you have this picturesque beach almost to yourself. The walk to the beach is about one mile and takes 20 minutes. Located adjacent to two of the only five star hotels and resorts in California, St. Regis Dana Point. Two other five-star resorts, The Ritz Carlton and Montage in Laguna Beach are nearby. In the beautiful upscale Dana Point/Monarch Beach area of Orange County. Dana Point is located on Pacific Coast Highway midway between Los Angeles and San Diego. Disneyland 31 miles, San Diego and Sea World 60 miles, Los Angeles 55 miles. You are only minutes from some of the best dining, shopping, beaches, golf and tennis in Southern California. This is a gated community and includes your own parking space. There are short stairs to climb when entering this top level 1,150 square-foot single-story Air Conditioned condo. This relaxing and tastefully decorated condominium is perfect for two couples or a family looking for a beach retreat. 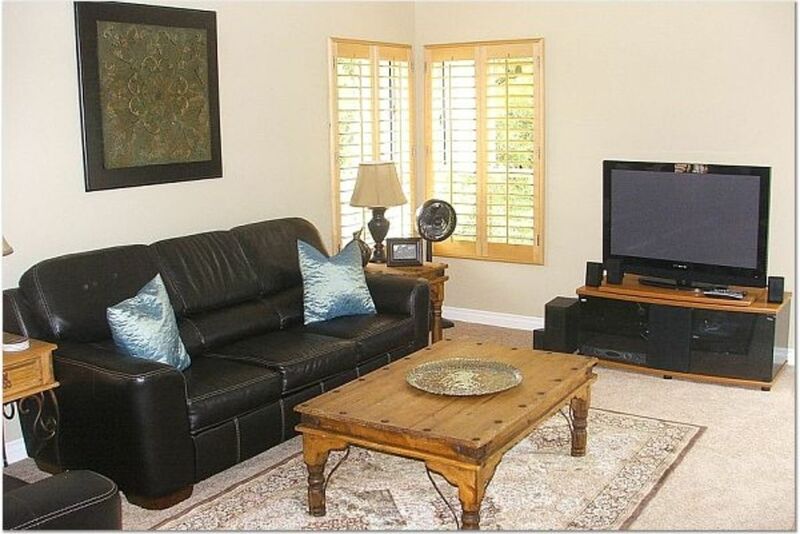 Walk into the spacious living room, fully equipped with a 42-inch plasma TV and DVD player. Each of the two bedrooms is also equipped with flat-screen TVs and DVD players. Enjoy breakfast, lunch or dinner in the separate dining room, or use the bar-b-q grill and relax at the patio table on the balcony. The kitchen is fully-equipped with dishwasher, microwave, toaster, blender, coffee maker and all your cooking needs. The master bedroom has a queen size bed and TV with your own private bathroom. The second room has 2 queen beds and flat screen TV. The condo also has its own laundry room with washer and dryer. No ocean view from condo. Pro's: clean, roomy, safe (gated community), shopping and restaurants close by in Laguna Beach and Dana Point, short drive to Disney (good for families with children), responsive manager easy to reach and speak with on the telephone about TV controls and problems with shower. Con's: problem with turning off shower in master bathroom (required a screw driver to tighten faucet after each shower), advertising on Home Away picture conveys the impression that the rental is closer to the beach than it actually is so check this out if looking for an ocean view. All in all, a good visit with our grandchildren who shared with us Thanksgiving dinner in what was an attractive but non-seaside setting before returning home on the east coast. I am glad you enjoyed your stay. I’m sorry about the loose knob in the shower, it has been replaced. Also, Im sorry you missed the first paragraph of our description which indicates that the property is one mile from beach. I hope you enjoyed this scenic walk during sunset. Thanks! We had a great time here. Beautiful walk to the beach. We had the pool and hot tub to ourselves every time we went. It was a beautiful area. Condo was great and well stocked with beach and swim equipment. We spent a week here with our family and had absolutely no problems. The condo was clean and well taken care of. The owner provided boogie boards, chairs and towels. The pool and Jacuzzi were clean and well maintained. Parking was easily accessible. We would definitely stay here again. My favorite part is the location to the running/ walking trail down to the beach. Top floor makes it quiet, all kitchen and bath stuff available, roomy and comfortable, private balcony lounge area all made it good. Ralph's, Trader Joe's and restaurants within 2 miles. 10-15 minute drive to Doheny and 30-35 minutes to San Onofre surfing. We enjoyed our stay and plan on returning. Great condo with great amenities. Close to beaches, shopping and dining. This is the third time we've stayed at this condo and we'll definitely be back. The unit is bright, spacious, and comfortable and comes equipped with everything you need for a relaxing, enjoyable stay. The owners are great to deal with and do a nice job of equipping the condo with beach accessories so you don't have to worry about getting them yourself. Golf: Monarch Beach Golf Links, a Troon Golf Course, is adjacent to the development.